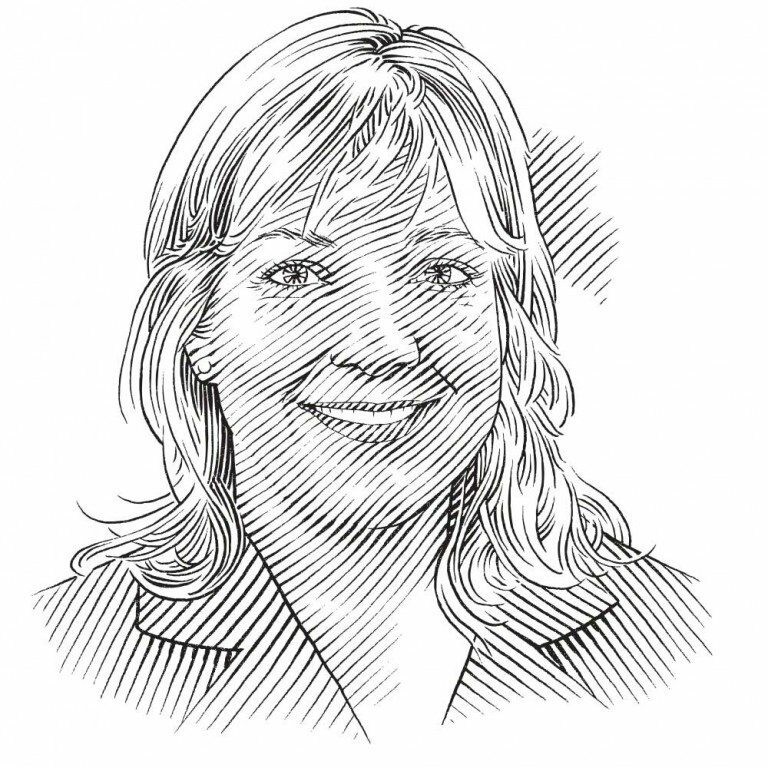 While public opinion appears to be turning in favour of sharks, Sonja Fordham thinks it’s time to draw attention to their lesser-known but equally threatened fellow chondrichthyans: the skates, rays and sawfishes of the oceans. A cowtail stingray in the Seychelles. Stingray coloration often reflects that of the sea floor, helping to camouflage the rays from predators. When was the last time you saw a protest outside a French restaurant serving raie (ray), a letter demanding the release of a captive stingray or a petition calling for an end to the cruel practice of ‘winging’ skates alive? These days, thanks largely to the advent of social media, it seems the Internet is ablaze with concern about the mistreatment and mismanagement of sharks. This enthusiasm and public support is encouraging and vital, especially considering all the damage done in the ‘only good shark is a dead shark’ era, but it is becoming increasingly apparent that a broader view of these exceptionally vulnerable animals is appropriate – and, in fact, urgently needed. Lately more than ever, I find myself reminding people that – in the contexts of biology and of international policy – the term ‘shark’ usually encompasses all the chondrichthyan fishes (that is, fishes with skeletons made of cartilage rather than bone), which include dogfishes, chimaeras and a wide variety of rays. Within this group, the chimaeras probably get the least love and dogfishes are subject to the most negative characterisations, but let us focus for the moment on the ‘flat sharks’, a wonderful array of cartilaginous species that encompasses skates, devil rays, mantas, sawfishes, guitarfishes and stingrays. These species share the inherent vulnerability of ‘proper’ sharks but perhaps not their charisma – and the consequences of this are deeply troubling. From a conservation perspective, it is important to stress that rays are generally more threatened and less protected than sharks. In fact, five of the seven most threatened families of cartilaginous fish are made up of rays (and that’s not even including the somewhat flattened angel sharks). These findings were presented earlier this year in the global Red List of Threatened SpeciesTM paper presented by the International Union for Conservation of Nature (IUCN) Shark Specialist Group (SSG). 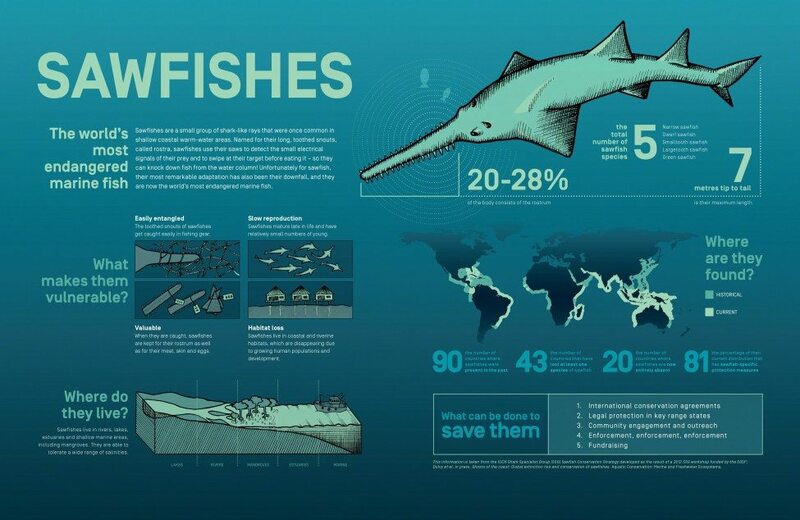 Of those threatened ‘flat shark’ families, the sawfishes are the most imperilled: all five species are classified as Endangered or Critically Endangered by the IUCN Red List. These exceptionally vulnerable shark-like rays have disappeared, practically unnoticed, from much of their former range and are assumed extinct in 21 countries where they used to be found. Indeed, the IUCN SSG has concluded that sawfishes are the world’s most endangered marine fish. As a result, they are the subject of a new, first-ever IUCN SSG Global Conservation Strategy, made possible through the generous support of entities like the Save Our Seas Foundation. Ten years after the initial proposal, the sawfishes were eventually listed under the Convention on International Trade in Endangered Species (CITES) in 2007; it took another six years to apply the global ban on international commercial trade to all sawfish species. While these were big and essential steps, trade is not the only threat to sawfishes. There is local demand for them and they are killed incidentally in fisheries targeting other species. They are also dependent on the health of their near-shore habitats. Yet only 16 of the roughly 90 countries where sawfishes occur have enacted national protective measures for them. The good news is that there’s a new proposal to list all sawfishes under Appendices I and II of the Convention on the Conservation of Migratory Species (CMS), an intergovernmental treaty. If agreed by the participating countries in November 2014, this initiative could prompt strict protection in key range states and provide a framework for implementing the IUCN’s Global Conservation Strategy on a regional basis. Also of great concern but lacking any global strategy or international treaty recognition are the guitarfishes. Killed incidentally by fisheries, landed for meat and prized for use in shark-fin soup, more than half of the guitarfish species are categorised by the IUCN as Threatened. Nevertheless, specific national protective measures are exceptionally scarce – and most of those that do exist appear to be poorly enforced. Even more important commercially are the skates, whose conservation status is the focus of a relatively small group of dedicated interest groups, including the UK-based Shark Trust. In both the United States and the European Union, smaller skate species tend to be faring better under heavy fishing pressure than the larger-bodied ones. At least for now, the largest and most depleted species are mostly off limits, while other skates are managed rather loosely. This is due to a lack of fine-scale information about the fisheries catches of individual species, since catches are usually aggregated across multiple species. In the US, landings of skates dwarf those of large sharks, yet testimony from conservation advocates about the management of the nation’s biggest skate fisheries (those of New England) has been rare. This is even as managers are lifting protection for the huge, famed barndoor skate, once thought to be heading towards extinction. Imagine the public outrage if a large portion of the US fishing quota for hammerhead or tiger sharks were allocated for bait in lobster fisheries. Yet this is the fate of most of the little skates caught in the US. Of the skates landed in the US for human consumption, most are exported to Europe and Asia. Efforts are, however, being made to promote local demand for these and other ‘trash fish’, at the same time that opposition to the consumption of large sharks (fins and meat) appears to be gaining ground. The number of skates fished in the waters between Europe and North America is subject to a rare international fishing quota system that is administered by the Northwest Atlantic Fisheries Organization. Yet since its inception a decade ago, the overall catch limit has been set far in excess of scientific advice. During that time, similar regional bodies governing international tuna fisheries in other parts of the world have granted a number of large sharks fully prohibited status. US fishing interests, particularly in the mid-Atlantic region, have made quite an effort to develop markets, both domestic and foreign, for cownose rays, which are taken mostly as by-catch in coastal fisheries. Not many elasmobranchs produce fewer young than this species; a female usually gives birth to just one pup per year. Yet, around 2007, various conservation-minded publications promoted cownose rays as seafood after a well-publicised (yet disputed) scientific paper claimed that cownose ray numbers had increased dramatically due to the depletion of large sharks and that the rays in turn were reducing the numbers of popular shellfish. The fishing industry capitalised on the media attention, changed the cownose ray’s name to the more palatable ‘Chesa-peake ray’ and worked to convince people that eating the species would be good for them and the environment. Fishery managers in Virginia – the core of cownose ray promotion – have yet to seriously entertain requests from noted scientists for precautionary catch limits or to request technical advice for management. There are also no cownose ray limits in nearby Maryland, a state that has banned all possession and sale of the fins of large sharks. Five of the seven most threatened families of cartilaginous fish are made up of rays. This cowtail stingray is a member of the whiptail stingray family. On a brighter note, in the past few years the Save Our Seas Foundation has been instrumental in elevating public concern for the plight of manta rays (see page 116). Arguably the most elegant and captivating of the rays, mantas have acquired relatively quickly a status comparable to that of many large, charismatic sharks, as well as a recent CITES listing. Just as importantly, mantas make excellent ambassadors for their kind and may open the door to a deeper appreciation of and better protection for other rays, from wedgefishes to pelagic stingrays. The first case in point is devil rays. Although they have so far failed to attract the support needed for a CITES proposal, devil rays are slowly making their way to centre stage in the international policy arena, primarily because they face risks similar to those highlighted for closely related mantas: strong Chinese demand for gill plates, unregulated by-catch mortality and low reproductive rates. A proposal to list mantas and devil rays under CMS is being considered and, thanks to the Save Our Seas Foundation’s support, the IUCN SSG has recently embarked on the development of a global conservation strategy for these species. Even fisheries managers are starting to take notice, at least in the eastern Pacific, where scientists have recommended specific techniques for maximising the survival of manta and devil rays taken as by-catch in the region’s tuna purse-seine fisheries. The adoption, refinement, expansion and proper implementation of the above-mentioned remedies would amount to significant steps in ‘flat shark’ conservation. But there is, of course, much more work to be done. As with sharks, there are hundreds of species of rays with varying life-history characteristics, habitats and threats. And also as with sharks, some faster-growing ray species should be able to support sustainable fisheries if strict, science-based limits are imposed. Other rays, however, simply can’t handle much fishing pressure at all. As we’ve seen with sharks, public concern and support can accelerate policy progress. Indeed, such backing is essential if the strong safeguards that are warranted for these inherently vulnerable yet under-appreciated species are to be secured. How you can help to spread the love? If you live in a country that is a member of the Convention on Migratory Species (CMS), urge officials of your environment ministry to support proposals to list sawfishes and manta and devil rays under the CMS appendices. Report any sighting of a sawfish – alive in the water or dead at a market – to the online International Sawfish Encounter Database. If you live in a warm-water coastal country, ask officials of your fishery ministry to establish measures for collecting data and safely releasing manta and devil rays caught in tuna fisheries. If you live in a cool-water coastal country, ask officials of your fishery ministry to work for science-based, international fishing limits for shared populations of skates. Spread the word and follow the conversation on social media via #RaysNeedLove2. Contact your government representatives as regularly as possible to express your support for precautionary local catch limits for skates and rays, protection for endangered species, conservation of critical habitats and research into population status.